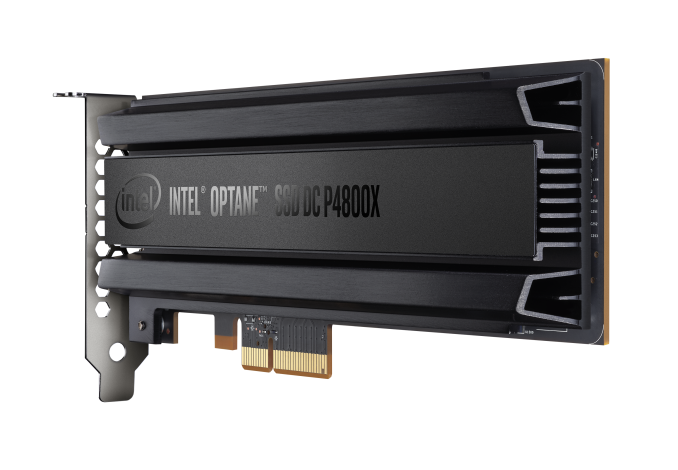 Intel's rollout of Optane products, based on 3D XPoint memory, continues. Today is the release of the 750GB Optane SSD DC P4800X, a larger capacity version of the model launched earlier this year. Now Intel's flagship enterprise SSD family has a more useful capacity while offering the same chart-topping performance as the 375GB model that launched earlier this spring. We tested the 375GB model earlier this year through remote access to an Intel server lab. Last month, we reviewed the consumer counterpart to the P4800X, the Intel Optane SSD 900p. Today, we have the results of hands-on testing of the 750GB P4800X add-in card model. The 750GB add-in card model was originally planned for a Q2 introduction, followed by the 750GB U.2 model and the 1.5TB models in the second half of 2017. Both 750GB models are now launching, and Intel says the 1.5TB models are "coming soon". This is a fairly minor delay, but that is of little comfort to customers who have been eagerly awaiting drives like this since 3D XPoint memory was first announced in July 2015. The performance specifications of the Optane SSDs stand out in several ways. The latency for reads at low queue depths is far lower than NAND flash-based SSDs. This can provide a boost to almost any application that waits on storage. With no complicated wear leveling and garbage collection process going on under the hood, the Optane SSDs offer much better performance consistency than most flash-based SSDs, to the point that Intel specifies 99.999th percentile latency for the Optane SSD. Perhaps most significant is that capacity doesn't affect performance. For flash-based SSDs there is usually a very strong correlation between capacity and performance. The simpler, more direct architecture of Optane SSDs cuts out most of the intermediate buffering that flash SSDs need to perform well. The sequential transfer speeds of the P4800X are not record-setting, and the read speed rating is actually 100MBps lower than that of the consumer Optane SSD 900p. However, nobody is going to buy an Optane SSD primarily for its sequential performance when flash-based SSDs can compete in that aspect at a fraction of the price. It is interesting to note that the sequential performance specifications are given for 64kB transfers, when 128kB is more common within the industry and 128kB transfers are supported by the Optane SSD. Power consumption is the only area where the specifications differ between the 375GB and the 750GB model. The SSD DC P4800X does not implement the standard NVMe power state management or Autonomous Power State Transition features, but it does have a power governor setting controllable through vendor specific commands. This allows the P4800X to be limited to 12W instead of the default limit of 18W. Since imposing a lower power limit will reduce performance, this feature is probably not going to get much use with a product like the P4800X. There may be a few situations where it could be of use with the U.2 model that has less surface area for cooling, provided that it leads to more consistent performance than simply letting the drives thermally throttle. The P4800X's write endurance rating of 30 drive writes per day is far higher than most enterprise SSDs and beats any previous Intel SSD, but it isn't actually high enough to put the Optane SSD in an entirely different class from the best high-endurance flash based SSDs. When the P4800X exhausts the rated write endurance, it will switch to a "write protect" mode where writes are throttled to 30MB/s. This is a gentler end of life strategy than the hard read-only mode that some of Intel's previous drives have used. The mode switch happens when the "Percentage Used Estimate" SMART indicator reaches 105%. Once the P4800X has reached its write endurance rating, it is specified for unpowered data retention of 3 months, which is standard for enterprise SSD. Intel doesn't say anything directly about data retention when the drive is new, but the do caution that the drive will perform background data refreshing. When the drive is powered on, it will devote more time than usual to background data refreshing for a period of about three hours, to clean up any data degradation that may have occurred while the drive was off for an unknowable period of time. The Optane SSD DC P4800X and the Optane SSD 900p both use the same 7-channel controller, which leads to some unusual drive capacities. The 900p comes with either 3 or 5 memory dies per channel while the P4800X has 4 or 8. All models reserve about 1/6th of the raw capacity for internal use. Aside from the number of 3D XPoint memory packages and the number of dies they contain, the PCBs of the P4800X and the 900p differ only in the presence of a few diagnostic LEDs on the P4800X. Neither model has any large power loss protection capacitors because the Optane SSDs don't use any volatile caches and write immediately to the 3D XPoint memory itself. The heatsinks and PCIe brackets are slightly different between the consumer and enterprise versions, but both are predominately black aluminum. The P4800X omits the solid backplate and instead places the label with model and serial numbers on the side of the heatsink. It's a bit odd Intel would go for the hypervisor solution since the kernel can handle tiered pmem and it's in a better position to know where to place data. "Advanced" may be the wrong way to look at it because ntkrnl can perform both sync and async operations, while Linux is essentially a sync-based kernel (the limitations surrounding its aio system are legendary). However, by focusing on doing that one thing well the block subsystem has become highly optimized for enterprise workloads.